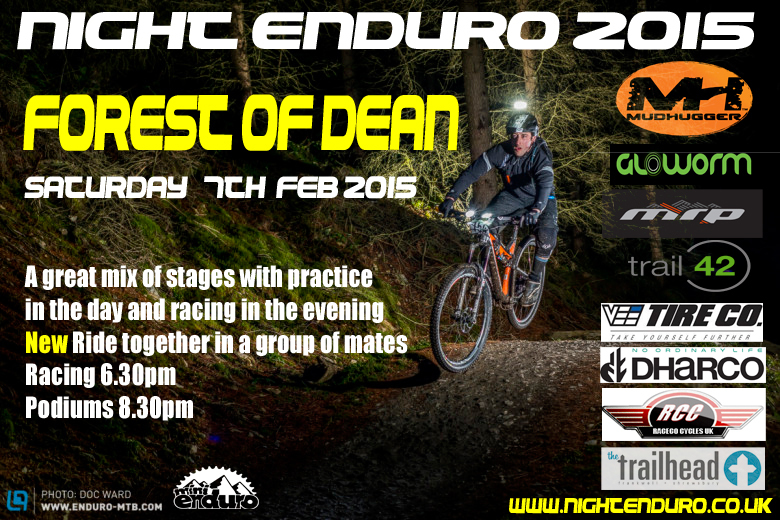 This first Night Enduro race will take place at Forest of Dean on Saturday 7th February 2015. Ride the stages during the day then race them when it gets dark. Loads of people now have lights for their bikes from cheap lights to the exotic and super expensive mega lights. Racing in the dark is real fun experience the race is for proficient mountain bikers who are use to riding off road at night. The map for the stages will be released before the race so you can pre ride all the stages in the day light. We understand that not everyone is as fit as a butchers dog so the stages will be open to ride on Friday night and also Saturday day time to allow the not so fit to have nice easy ride round all the stages. The loop will start from Peddle a Bike way Cafe, the transition times have been set so everyone can make it round in under 2 hours which should be about perfect for most people lights and gets you back in plenty of time for a hot food and drink at the Cafe before the podium presentations. Mud Hugger front mud guard for winners of each category. MudHugger have very kindly sponsored winner of each category with Front MudHugger for the winners. The 3 stages are for mountain bikers who are used to physically demanding routes. We have carefully also chosen two great new stages along with one of our favorite stages to give you a good test of bike handling skill in the dark, these take it away from the mud and the more demanding descents of previous mini enduro races held at FoD. You will have plenty of time to practice these during the day on Saturday or even on Friday night if you want to get out and test your lights in the dark. Post Code for Sat Nav is GL16 7EH but check the map as this may put you in the centre of Coleford or at the cottages down the road. The Night Enduro’s will take place over one day and will be of a shorter distance to the Uk Gravity Enduro’s to allow riders to practice the the 3 stages before the start of the race later after dark. Distance will vary but expect around 14 miles to complete the 3 stages and the route. With a practice lap and the race you will cover around 30 miles. The transitions are not timed so no penalties for being late and will follow the marked route to keep everyone going in the right direction. Racing in the dark is real fun experance the race is for proficient mountain bikers with a skill level who can ride challenging features of FoD in the dark. Entry is open now click here to enter. New Ride with a group of mates or in a team. If you want to ride together in group of friends or in a team just fill in the box with your Group/team name on the online entry form and we will group you together so you start all the stages together. (You race results will still be for the category you entered). Pedal Assist Bicycles are great for the less active riders to race on, they get there own category to race against each other. An Open or Full Face helmet must be worn during all race and transition stages. Saturday 7th February 2015 – Stages open to ride. You must have sign on and collected your number board by 4.30pm to race. Medics and Marshals on all Stages. will be posted in Registration on Saturday Afternoon. Active Transponders will be used for this race which will need to be attached to your bike. The race will use Tag Heuer Professional timing equipment for the back up on each stage. With the new transponder system we will give you live and instant results from all the stages at the finish. This mean’s a serious investment in extra new equipment but we want to give you the rider the best experience possible. Entries will go live on Tuesday 13th January 2015.